Number of fraudulent emails from spam botnet Necurs reached 35 million in 2016. Q1 2017 saw only 7,000. So do we see a decrease in malware in 2017? Alisa Bagrii is a tech writer and a computer geek. Alisa Bagrii is a tech writer and a computer geek. Currently works with cybersecurity. It goes without saying, the Internet access pleases us not only with the relevant and up-to-date information and many other possibilities, but also with numerous fraudulent attacks and malware. Marketing industry is not an exception if to consider email marketing in particular. Unfortunately, billions of emails sent on a daily basis appear to be spam with malicious attachments. According to Kaspersky Lab’s report, the number of such fraudulent emails from the largest spam botnet Necurs reached 35 million emails in 2016, but the first quarter of 2017 has shown a significant drop in their number – only 7,000 for 3 months. So what awaits us this year and will we be vulnerable to malware? Unfortunately, we will. 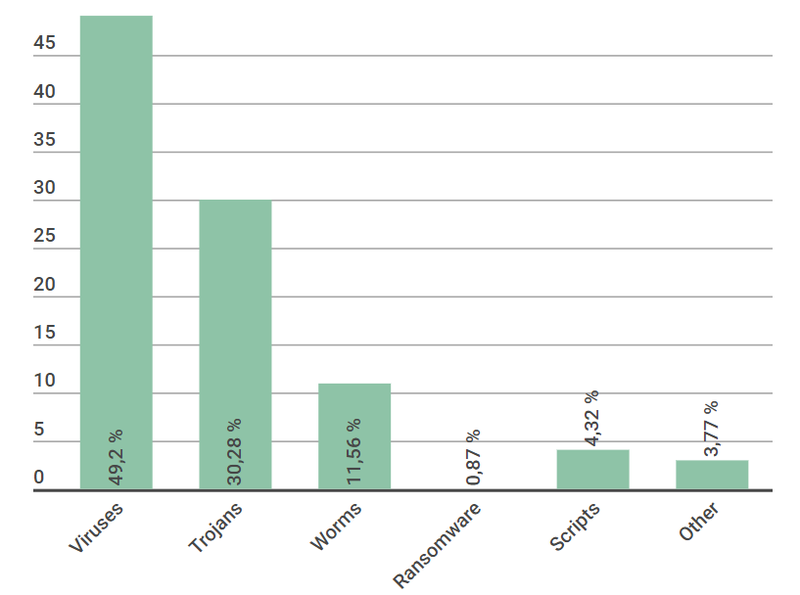 viruses talk the leading position (49.2%), Trojans have won the second prize (30.28%) and the third place belongs to worms (11.56%). The distribution of this malware was also unequal. The highest malware infection rate was in China and Turkey (over 40%). The top ten countries with the same problem includes Taiwan, Guatemala, Ecuador, Russia, Perú, Mexico, Venezuela and Brazil (over 30%). It is difficult to believe that this year they will significantly decrease these rates. 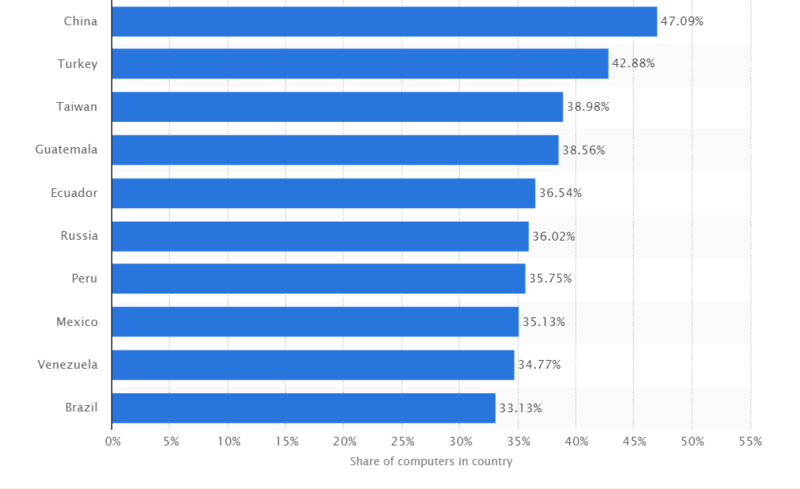 At the same time, the least malware infected countries were Sweden, Norway and Finland (about 20%). UK and Germany take the 10th and oath place correspondingly with the percentage rate of about 23-24%. The biggest number of cyber crimes was in the entertainment industry, the second place was taken by finance and the third one was divided between healthcare and education. Despite the decrease of Necrus spam emails, the number and power of modern malware has not got lower significantly. New variants of viruses continue to appear. May 2017 was struck by the data from Check Point Software that reported about a new version of WannaCry ransomware that could infect over 3.5 thousand computers every hour. The initial attacks have infected over 200 thousand computers in 150 countries. Of course, the a key mechanism of the virus was disabled, but there was no protection from the second attack the possibility of which was rather high. Unfortunately, the second attack has also taken place infecting over 40 thousand computers worldwide. Europop has admitted that it is the first time they see such a malicious ransomware. Numerous Chinese governmental and scour establishments have suffered from the second attack of WannaCry. Railroad in German, Hitachi Ltd in Japan, hospitals in Indonesia, a variety of UK facilities – the malware influenced the most highly protected organizations. Despite the security patch from Microsoft released against this malware there are still new variants discovered regularly so there is no guarantee of safe and secure work of every computer in the world. Read More: What is a NonMalware (or fileless) attack? If you wish to avoid malware attack, you should be armed with the way it spreads and tools that may protect your PC. As soon as a system is infected, malware damages its boot sector, data files, installed software and a BIOS system as well. That may lead to system corruption and loss of many important files. It can spread around the system without any difficulties through social networks, pair software, removable media and specially created websites. They can kill the system or provide anyone with access to it depending on malware type, so it is important to think about security of the PC. The system can be protected by the latest anti-virus software like Kaspersky or NOD, for example. They will not only perform regular checks of the system, but also restrict access to malicious website and media. Emails can be protected by Spam filter like Everycloud, that will notify about any dangerous emails and keep your email box safe. Though almost all security departments all around the world struggle against cyber attacks, crimes and malware, we will be still vulnerable to them in 2017. 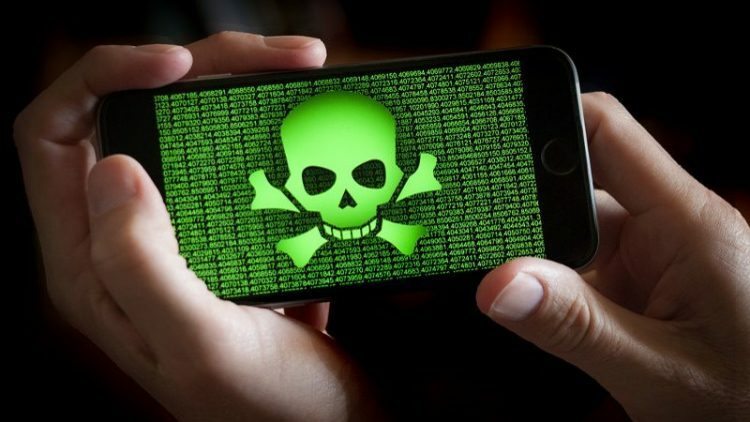 What is more, some of this malware gets even more powerful and dangerous than it used to be before. New versions astonish even the most experienced security experts, so ordinary people are not protected as well.